Using a screwdriver, detach the knob. 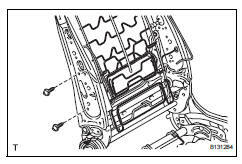 Disconnect the 2 rubber bands of the front seatback board from the front seat frame (with adjuster). Using a screwdriver, detach the 3 claws and remove the cushion shield (with front no. 1 Seat cushion inner shield). 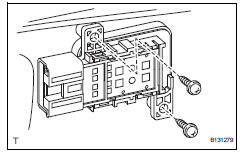 Disconnect the connector from the front power seat lumbar switch. Remove the front no. 1 Seat cushion inner shield from the cushion shield. Using a screwdriver, detach the claw and remove the inner shield. Remove the 2 screws and switch. 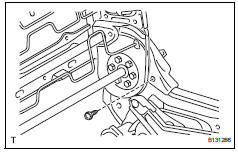 Using a screwdriver, detach the 3 claws. 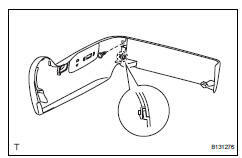 Using a clip remover, detach the clip and remove the inner shield. Disconnect the connector and remove the switch. 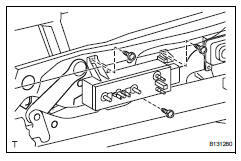 W/ seat heater system: disconnect the connector. Using a clip remover, remove the 2 clips. 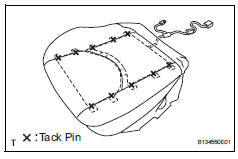 Detach the 2 hooks on the seat cushion front side. Using a screwdriver, detach the hooks and remove the seat cushion cover (with pad). 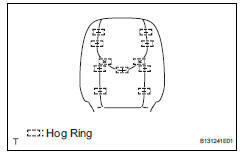 Remove the 15 hog rings and seat cushion cover from the seat cushion pad. 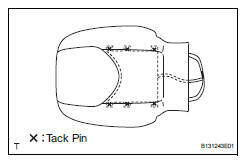 Cut off the 10 tack pins which fasten the seat heater, and then remove the seat cushion heater from the seat cushion cover. 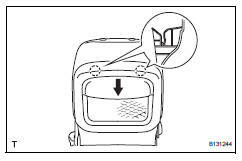 Be careful not to damage the seat cushion cover and seat heater. 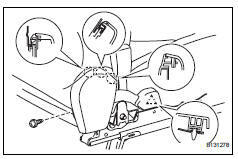 Open the lower part of the seatback board. Then remove the 2 screws. 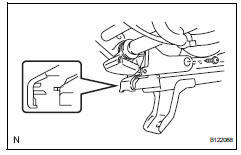 Pull the seatback board in the direction indicated by the arrow in the illustration to detach the 2 claws. 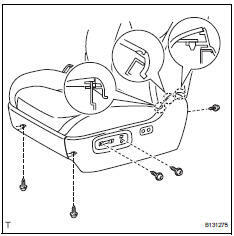 Then, remove the seatback board. 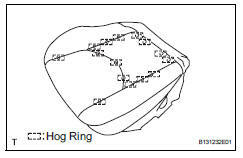 Remove the 5 hog rings. Using a screwdriver, detach the hooks. 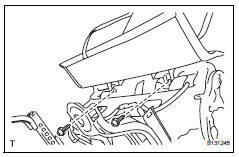 Detach the 4 claws and remove the 2 headrest supports. 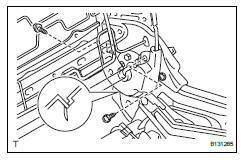 W/ front seat side airbag: remove the nut and move the 2 seatback cover brackets. 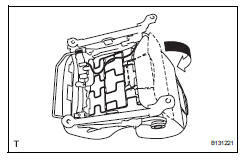 Remove the seatback cover (with pad) from the seat frame (with adjuster). 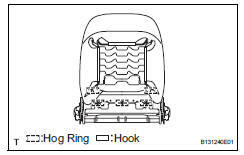 Remove the 11 hog rings and seatback cover from the seatback pad. 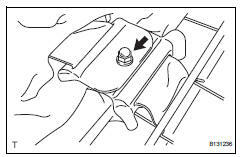 Cut off the 6 tack pins which fasten the seat heater, and then remove the seat cushion heater from the seat cushion cover. Detach the claw and remove the inside cover. Remove the screw and inside cover. 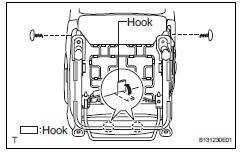 Detach the hook of the lower shield and remove the lower shield. Remove the 2 screws and lumbar support adjuster.